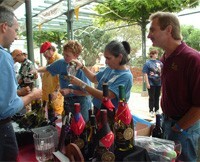 The Fredericksburg Food and Wine Fest will be in its 21st year on October 22, 2010, from noon to 7 pm. Held in downtown Fredericksburg, Texas, on Marktplatz (the 100 block of West Main Street), it is a full-course celebration of Texas food, wine, music, specialty booths, food court, and fun for all. $20 General Admission includes the following: Souvenir Fest wine glass, Six Tickets towards wine tastings (6 tickets = 1 glass or 3 samples), Five sessions of the popular Grape Expectations Cooking School,Great music, an auction and the Great Gargantuan Grape Toss, Texas wine & Texas specialty food to sample, admission to the Food Court (Purchase more food). Call 830-997-8515 for more information.